Although An Apple a day can keep a doctor away, but now research says that three cups of tea a day can also help in curing heart problems and diabetes. A review shows regular drinking of black tea, with or without milk, can reduce the risk of heart problems by cutting levels of bad cholesterol and blood sugar. Experts say the benefits of tea are largely due to the flavonoid content – antioxidant ingredients that counteract cardiovascular disease. One cup of tea provides 150-200mg of flavonoids and it is the best source of antioxidants in the nation’s diet. 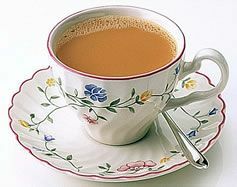 In terms of the delivery of antioxidants, two cups of tea is equivalent to five portions of vegetables.